Like yesterday’s recipe for icy frozen granitas, todays post is also adapted from the June issue of Food Network Magazine. This one from Chef Marc Forgione, calls for rib-eye steaks, red wine and veal stock but I used smaller filet mignon cuts, balsamic vinegar and beef stock. Forgione’s recipe originally caught my eye because one of my favorite meals ever is the blueberry and balsamic steak at Aqua Al Due, a restaurant I fell in love with when I was studying abroad in Florence, Italy. It was our favorite place for a special dinner out and I’ll never forget those incredible meals of pumpkin pasta, steak and chianti. 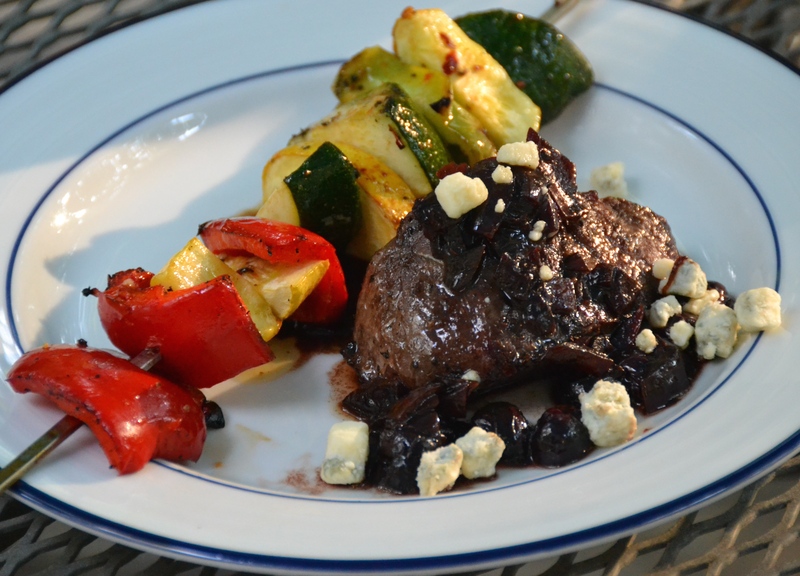 The balsamic and blueberry flavors make for a bitter and subtly sweet sauce—a perfect complement to beef and blue cheese. We ate our steaks with Grilled Vegetable Kabobs with Firecracker Sauce and I pretended like I was back in Florence for the night. This recipe is number eleven in my endeavor to cook thirty recipes perfect for your July 4th cookout. You can find the previous ten recipes here.